In 2014, Intelligence Ministry agents arrested Dori Amri and three other Baha’is as they took part in a prayer ceremony. They each received one-year prison sentences at Branch 3 of Mashhad’s Revolutionary Court, which is presided over by Judge Mohammad Soltani, who has been accused of violating the human rights of defendants. Two other defendants in the case, the mother and daughter May Kholousi Fadaei and Saghi Fadaei, started their prison term in Mashhad on October 31, 2018. Dori Amri started her sentence in the aftermath of the loss of her grown child, who was recently killed in an accident. The judge responsible for carrying out court verdicts refused to take her grief into consideration and issued a warrant for her arrest rather than postponing her sentence. Amri was forced to present herself at the prison. The initial arrest goes back to the night of Monday, June 2, 2014, when Intelligence Ministry agents in Mashhad raided the home of May Kholousi. At the time, three other Baha’is were participating in a prayer gathering in the house. The agents first read the names of several Baha’is from a piece paper but none were present at the gathering. Then they asked the names of those present and searched the house. After some time, the agents called out the names of Dori Amiri and Shayan Tafazoli and sent the two, accompanied by a number of agents, back to their homes. The third person was free to leave without agents. “The inspection of their homes continued well past midnight. 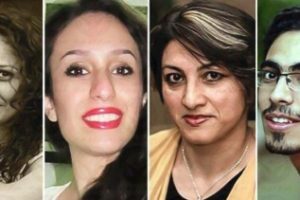 After searching and confiscating religious texts and a number of personal effects the three — May Kholousi, Dori Amiri and Shayan Tafazoli — were taken to Mashhad’s Intelligence Bureau,” an informed source told IranWire. According to the source, 35 days after the arrest of May Kholousi the agents again went to her home and arrested her daughter Saghi Fadaei. Saghi Fadaei was released after a month in detention, but on Thursday, September 11, 2014 she was summoned to the Revolutionary Court in Mashhad, arrested again and was sent to the detention center of the city’s Intelligence Bureau. A month earlier her mother and the two other detainees had been transferred to Vakilabad Prison after being interrogated. In November 2014, after five months in detention, May Kholousi, Dori Amri and Shayan Tafazoli were released on a bail of 300 million tomans, around $72,000, each. They were tried on December 18, 2017 at Branch 3 of Mashhad’s Revolutionary Court presided over by Judge Mohammad Soltani, who handed down a sentence of one year in prison for each of them. Branch 20 of the Appeals Court in the province of Razavi Khorasan reviewed the verdict on Saturday August 26, 2017. The appeals court upheld the verdict and informed the defendants of its decision in February 2018. On Wednesday, October 31, 2018, May Kholousi and her daughter Saghi Fadaei presented themselves at the Revolutionary Court in Mashhad and were transferred, under guard, to Vakilabad Prison. The mother and daughter were sent to the same ward that, until a few months earlier, two sisters, Nava and Nika Kholousi, had been kept. Nava was released in the fall of 2017 after four years in prison and Nika served five years in prison before she was released in the summer of 2018. The two sisters are the daughters of Manouchehr Kholousi, May Kholousi’s cousin, who served one year in prison from 2016 to 2017 at the Intelligence Bureau’s detention center and Vakilabad Prison. 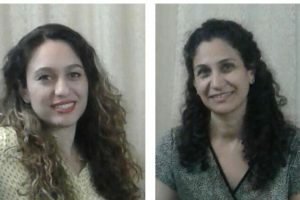 With May Kholousi and Saghi Fadaei beginning their prison sentences, there are now four Baha’is serving time in Vakilabad. 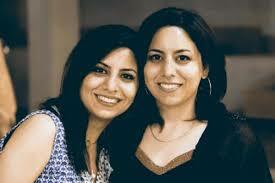 One of them is Fataneh Nabilzadeh, who started serving her one-year sentence in July 2018. Shayan Tafazoli, the fourth person in the case, is scheduled to present himself at the prison to start his sentence soon. Shayan Tafazoli has been tried and sentenced to prison before. In recent years, the Tafazoli family home has been raided and searched repeatedly and members of the family have been tried and imprisoned. Shayan has been arrested and has been tried three times for propaganda against the regime. The first time he was acquitted for lack of evidence but had to pay a fine of 300,000 tomans, a little over $71. His sister Sanaz Tafazoli spent six months at Vakilabad on the same charge and her husband Babak Rouhi has been sentenced to five years in prison, although the sentence is currently suspended.